As we approach the launch of the DIY Natural Cleaning Challenge my head has been filled with all-things natural cleaning. In fact, reading and rereading the eBook has deepened my love for natural cleaning, and I’m the author! PS: I promise, we will get back to more food (recipes and tips) and body-care soon. Thank you for joining me this month for a heavy-duty dose of natural cleaning! I hope you’ve been inspired to give natural cleaning products a chance in your home. 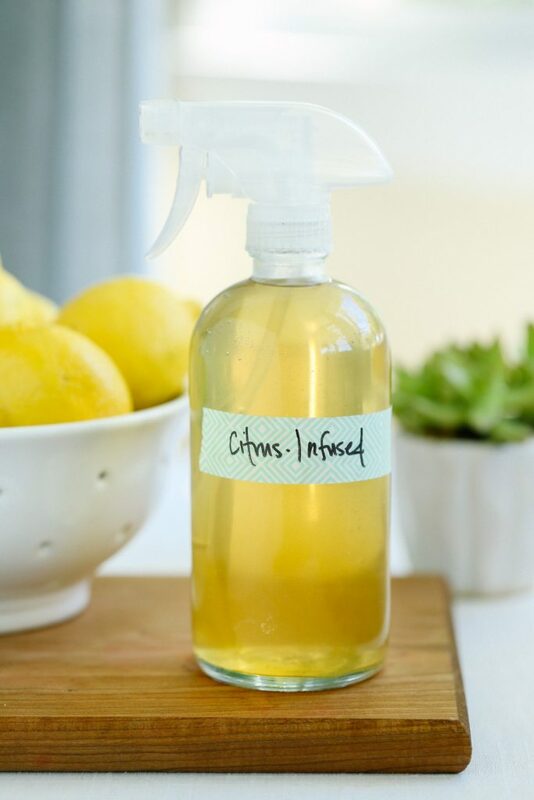 So, in the spirit of natural cleaning, let’s talk about one more super easy and inexpensive do-it-yourself cleaner that you’ll find in my cleaning toolkit: Citrus-Infused All-Purpose Cleaner. 1. Versatility. There’s a bit of an investment required when you first “take the plunge” into making cleaning products, but here’s the amazing news: the same cleaning ingredients can be used in multiple ways! 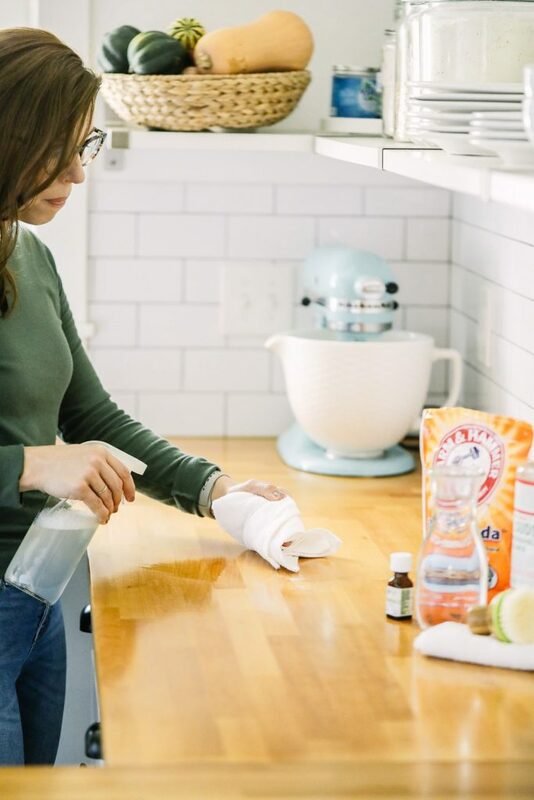 With one bottle of vinegar you can make Citrus-Infused All-Purpose Cleaner, window cleaner, a toilet disinfectant, laundry softener, garbage disposal pods, and even a fridge deodorizer. $4 (that’s a guess, my friend, prices always vary) goes a long way when it comes to cleaning a home. Let’s take a look at another ingredient: baking soda. Yep, the stuff you add to your favorite banana bread recipe! With a single package of baking soda you can remove odors from the fridge, scrub your oven back to a sparkle, deodorize carpets and rugs, and clean a toilet. $4 goes a long way once again. 2. Confidence. We’ve talked about this in the past, but it’s worth mentioning again, many cleaners (since cleaning products aren’t considered food) don’t list the ingredients on bottles or packages. As a real foodie, an ingredient list is a valuable tool that helps me determine if a packaged food is something I want to bring into my home or not. I use the same discretion when purchasing and using cleaning products. By making cleaners at home, I know about the ingredients I’m spraying in my home and around our kids. 3. Simplicity. 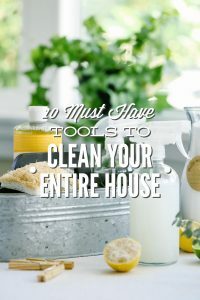 The phrase “make your own cleaning products” doesn’t sound like a simple or easy task, but friend, I’m here to say that there’s simplicity in DIY cleaning. 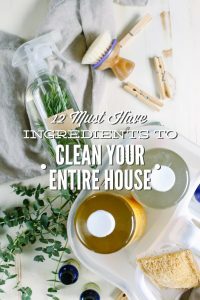 Making homemade cleaning products has a bit of a learning curve at first, but once you determine what you actually need to clean your home, there’s amazing simplicity in knowing how to create a cleaner in less than five minutes that can then be used in multiple ways. Today’s do-it-yourself recipe, Citrus-Infused All-Purpose Cleaner, fits all three of my practical reasons for why I choose to make homemade cleaning products. What exactly is Citrus-Infused All-Purpose Cleaner? 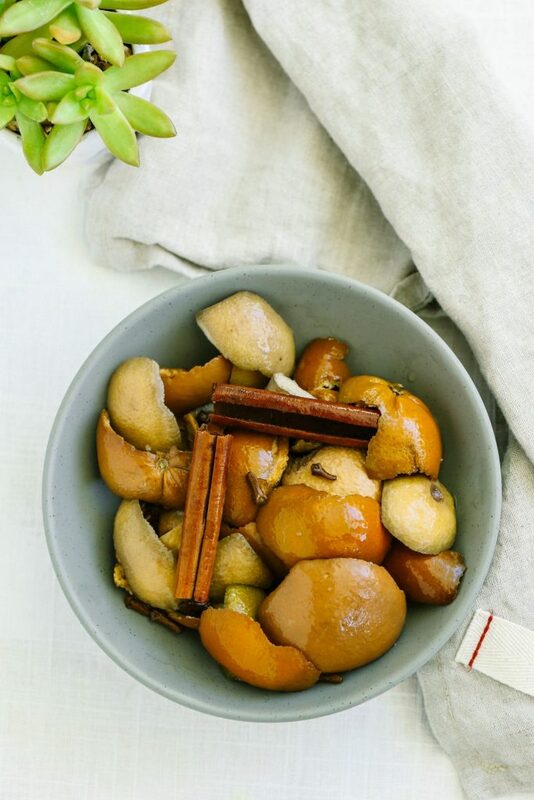 This cleaner is made with just a few basic household ingredients: white vinegar (I used Four Monks Cleaning Vinegar in this recipe which has 6% acidity, which is 20% stronger than traditional vinegar), leftover citrus peels (clean grapefruit, lemon, orange, or lime peels work great), a cinnamon stick, and cloves. The citrus and spices are infused in the vinegar for two weeks, and then strained. After a two week infusion, the final result is a beautiful, natural orange-colored cleaner with a scent of citrus and warm spices. This cleaner is considered a “concentrate” since it’s not used as-is for cleaning. The concentrate can be added to just about any homemade cleaner recipe calling for vinegar. And since this recipe is concentrated, and it’s basically made with just (clean) kitchen “scraps,” this recipe is both a multi-use product and money-saver. I add 1 cup of water and 1 cup of Citrus-Infused All-Purpose Cleaner to a 16 oz glass spray bottle, and shake the bottle to combine the ingredients. I spray my counter-tops, the sink, cutting boards, the garbage can, or the inside of my fridge (between shopping trips) with the spray. After spraying the cleaner, I always wipe the surface with a clean, damp cloth. Caution: Never use vinegar (which is acidic) on granite or marble surfaces. Recipe Adjustment: This cleaner may be reduced to 1/2 cup of vinegar and 1 1/2 cups of water. My garbage disposal can get a bit stinky. To make garbage disposal pods, using this cleaner, I chop 2-3 lemon peels (depending on the size of the lemon) and add them to an ice cube tray. Then, I pour the Citrus-Infused All-Purpose Cleaner over the top of the peels, and freeze the ice cube tray. Once the pods are frozen, I remove them from the ice cube tray and store the pods in a freezer-safe container. To deodorize and clean the garbage disposal, I run cold water in the sink, place 1-2 pods in the garbage disposal, and then run the disposal. This idea applies to the whole house. 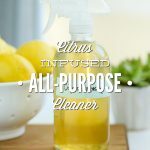 Instead of using plain ol’ white vinegar, I add Citrus-Infused All-Purpose Cleaner to my homemade glass cleaner (grab the recipe). While I use this recipe on glass surfaces, I don’t use vinegar on my smartphone screen or computer monitors since acid can strip the special coating. For a super simple degreaser, I use the all-purpose spray (recipe above: “All-Purpose Spray”) and add a few drops of natural dish soap or Sal Suds (not castile soap, remember the reaction issue??). I use this to cut grease in the kitchen when I don’t have time to make a separate degreaser. 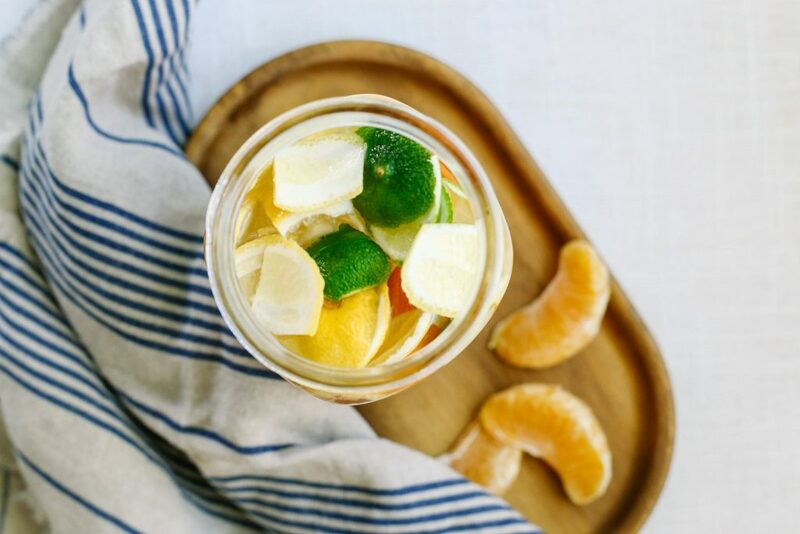 Add the citrus peels and spices to a quart-size glass storage container. There should be enough peels to fill the jar. Pour the vinegar over the peels and spices. The vinegar needs to rest, preferably in an area with lots of sunlight, for 2 weeks. Gently shake the container every few days to stir the ingredients. I've found that vinegar will slightly rust metal lids, so I use a heavy towel and rubber-band over my storage jar, or a Weck jar with a glass lid. After 2 weeks, strain the citrus and spices from the liquid. Pour the infused vinegar into a clean storage container. I store my concentrate in the fridge. To Use: Find my ideas for using this cleaner under the "Ideas for Using Citrus-Infused All-Purpose Cleaner in the Kitchen" section (above). This cleaner may be used in place of white vinegar in most homemade cleaner recipes. Find all my favorite cleaning ingredients, here. Hey Tessa, I purchase most of my spray bottle from Sally’s on Amazon (best spray bottles ever!! ): http://amzn.to/1lMPgUD. You can also make spray bottle from vinegar (or Perrier) bottles: https://livesimply.me/2015/07/29/make-your-own-glass-spray-bottle/. Does this still work if I use regular vinegar? And if so, would it still be considered concentrate? Hey Julie, Regular vinegar is great for cleaning! You can definitely use regular vinegar in place of the citrus vinegar. The citrus vinegar is considered a concentrate because it’s a master cleaner that’s usually diluted with water for cleaning. If using regular vinegar would the amounts stay the same? Hey Julie, Yes, you would :). I love the citrus infused vinegar cleaner idea! I’ve tried many homemade recipes and I am always really happy with the results. 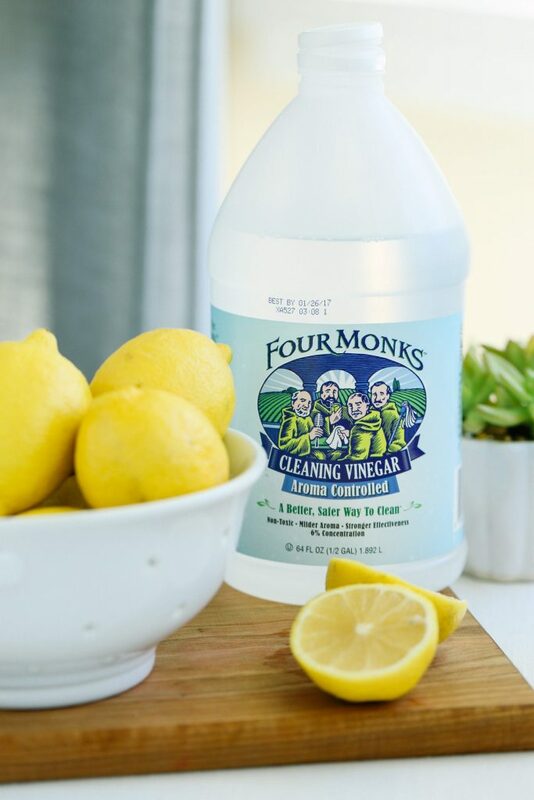 The vinegar spray by Four Monks is a great cleaning spray. I love using it because it doesn’t have the overwhelming smell of vinegar. Thank you for the recipe! I will definitely try it out! Hey Jen, I’m glad you’re enjoying the recipes and tweaking them as needed. Any white vinegar will work great in this recipe! I’ve used Monk’s, Heinz, and Spectrum brands with great success. I believe Monk’s is primarily sold online and at Walmart right now. Does the cleaner still work as well if you use regular vinegar? How long can you keep it for before it goes bad…I know vinegar can be kept for a long time but I’m just wondering because it’s infused with the citrus peels. Yep, any white vinegar will work. Once the peels are drained, you can keep the cleaner in the fridge to extend its life. It should last a few months in the fridge. Hey Alexandra-Maria, Yes, you can, if vinegar works well with your hair. Is there a way to speed up the process. For example, infusion in a crock pot or oven? Hey NELSA LOZADA, I don’t believe so. You could try with a small amount. Hi what do you recommend for an all purpose kitchen cleaner is you have granite? Thanks! Hey Karyn, I recommend using 1/3 cup rubbing alcohol, filling the rest of the 16-ounce bottle with water, then adding the Sal Suds. The only issue with the rubbing alcohol is that it shouldn’t be used on any wood surfaces. Here’s the recipe idea (without the vinegar): https://livesimply.me/2016/12/09/purpose-cleaner-spray-grease-cutting-power/. Your blog says to infuse the vinegar in sunlight. Another blog i read says in a dark place? I’m confused. What’s it really supposed to be? Thanks. Hey Rose, I can’t speak to the other blog’s instructions. But from my reading, infusions are usually does in the sunlight. Once the citrus vinegar has been made, you can store it in a dark space. Thanks, Kristin, for responding. I just read your response now. I have another question which should be in another post but can I just ask it here :). What is the difference of your toilet/sink scrub with your tub scrub? Why do you have separate scrubs? 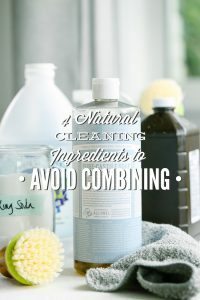 I want to start doing my own cleaners and I want to make as least as I can so I want to do multi-use/all-purpose cleaners so I will not be overwhelmed with so many cleaners. Haha. Thanks so much. Hey Rose, the toilet/sink scrub is a powder and the toilet/tub scrub is a cream scrub (so it’s a wet scrub). It’s just a matter of preference :). I personally use the tub scrub for my sinks, toilets, and tubs. Should I use boiled water when diluting the citrus infused vinegar for the all purpose cleaner so it lasts longer? Also I used a 5% vinegar to make the citrus vinegar, would the ratios of 1 cup water, 1 cup citrus vinegar be as effective (when making the all purpose cleaner) as if I’d have used a 6% vinegar? Hey Diana, I would use boiled water or distilled water. You can keep the same ration with the 5% vinegar :).